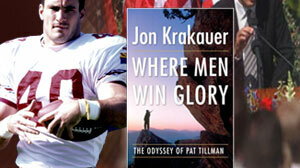 Where Men Win Glory: The Odyssey of Pat Tillman, the new Jon Krakauer book. U.S. Army Ranger Pat Tillman's first mission as an elite Army Ranger in Iraq was the rescue of Pvt. Jessica Lynch, a new book reveals. And although Tillman played only a bit part in Lynch's rescue, he quickly concluded that the mission had motives beyond military strategy. "We leave tomorrow,'' Tillman wrote in a series of journal entries in Jon Krakauer's 'Where Men Win Glory: The Odyssey of Pat Tillman," a new book about the tragic friendly fire death of the former NFL star who left a lucrative football career behind after 9/11 to serve in the military. "This mission will be a P.O.W. rescue, a woman named Jessica Lynch. As awful as I feel for the fear she must face, and admire the courage I'm sure she's showing, I do believe this to be a big Public Relations stunt. Do not mistake me, I wish everyone in trouble to be rescued, but sending this many folks for a single low ranking soldier screams of media blitz." Lynch had been falsely portrayed by Pentagon officials as a heroic soldier who went down firing her rifle at her Iraqi captors, when in truth she later testified that she never fired a shot and was captured after her vehicle crashed. Just over a year later, many of the same Bush administration officials and military commanders would scheme to transform Tillman's own death by friendly fire in Afghanistan into a similarly disingenuous tale of battlefield valor. Tillman was one of the most potent and misused symbols of post-9/11 patriotism in America. As the most famous American soldier in the newly-launched War on Terror, Tillman had received a personal note of congratulations from Secretary of Defense Donald Rumsfeld after he enlisted. The former Arizona Cardinals hitman was highly-suspicious of being used by his superiors to market a war about which he was openly ambivalent, according to Krakauer's book. When the Army asked Tillman to do media interviews, he refused. And soon after arriving in Iraq as an Army Ranger, he shared his wariness with a friend. "When we were in Baghdad, our cots were next to each other," Spc. Jade Lane told Krakauer. "Pat and I used to talk at night before we'd rack out. I don't know how the conversation got brought up, but one night he said that he was afraid that if something happened to him, they would parade him through the streets. And those were his exact words: 'I don't want them to parade me through the streets.' It just burned into my brain, him saying that." Under the 'special instructions' section of a standard Army form, Tillman had scrawled in block letters: "I do not want the military having any direct involvement in my funeral." Krakauer supplemented months of frontline reporting from Iraq and Afghanistan in 2006 and 2007 and scores of military documents with the exclusive access to Tillman's personal journals and interviews with Tillman's family, teammates and coaches, fellow soldiers and even neighbors on the block where his mother lived. Woven through undulating tales of struggle, both global and personal, that crisscross lives and borders and history, is a sweet love story between a young athlete and his wife Marie, who he'd known since the age of four. Six investigations and several congressional hearings would follow Tillman's tragic death. While some of the Rangers in the firefight were reprimanded and bumped back to the regular Army, no one was ultimately held responsible. The official misrepresentations in both the Lynch rescue and the Tillman friendly fire death came to represent some of the worst aspects of a highly controversial war in Iraq. It would be several years before both Lynch and Tillman's families would find voice, together, at a hearing on Capitol Hill called 'Misleading Information From the Battlefield." "The handling of the situation after the [Tillman] firefight was described as 'missteps, inaccuracies and errors in judgment which created the perception of concealment,'" Tillman's brother and fellow Ranger Kevin Tillman testified before Congress in April 2007, with Jessica Lynch sitting nearby. "Writing a Silver Star award before a single eyewitness account is taken is not a misstep,'' Kevin Tillman said. "Falsifying soldier witness statements for a Silver Star is not a misstep. These are intentional falsehoods that meet the legal definition for fraud. Late in the afternoon on April 22, 2004, the Tillman brothers were part of a convoy of Army Rangers in eastern Afghanistan's Khost Province, one of the most dangerous regions in the fractious country. The platoon had been stopped for six hours while the platoon's lieutenant argued with superiors back at headquarters about a disabled Humvee. Regulations prohibited the men from stripping the Humvee for parts and detonating it and no helicopter was available to airlift it out, they were told. The platoon was ordered to tow the wreck to a paved road on the far side of a mountain summit. But they were also under orders to have "boots on the ground" in a nearby town to complete the day's mission, scouring the small village for arms and insurgents. It was, Krakauer says, the most ordinary of missions, one of dozens of sweeps they do each week. Despite vigorous objections from the Ranger commander on the ground, who argued that splitting the platoon would put both groups in danger, the platoon was divided. The first half of the group, dubbed Serial One, headed through a narrow canyon toward the village of Mana. Pat Tillman was in Serial One. The other half of the platoon, Serial Two, took a different route toward a mountain pass. Tillman's brother, Kevin, was in Serial Two. But Serial Two's route appeared impassable, Krakauer reports, so they retraced their steps and followed the same route Serial One had taken -- through a dangerously narrow canyon. Krakauer describes Pat Tillman and the first convoy's journey through the canyon. "For the next twenty minutes the convoy crept through the claustrophobic rift, forced by the severity of the terrain to move at an excrutiatingly slow pace,'' he writes. "The slot was so tight that the Humvees' fenders scraped against its sheer walls. The Rangers remained twitchy and anxious, expecting to be attacked from the high ground at any moment." According to Pvt. Bryan O'Neal, "'The canyon was very rough, there were large boulders everywhere, and the walls were at least 100 feet high on each side. I actually had to lay on top of the vehicle to be able to pull security.' The cliffs rose so precipitously that O'Neal had to lie on his back in order to scan the canyon's ledges for Taliban through the scope of his M4 carbine." O'Neal and the other Serial One soldiers made it safely through the canyon, but drew enemy fire from across a ridge as they emerged from the canyon. Then, from behind them, gunfire erupted inside the canyon. The Rangers in Serial One looked back to see red tracer bullets blasting out of the passage, and scrambled to position themselves to provide cover fire for their embattled fellow soldiers. Pat Tillman was ordered up a hilltop. "Pat was like a freight train,'' Pvt. Josey Boatwright told Krakauer. Boatwright said Tillman sprinted past him. "Whoosh. A pit bull straining against his leash. He took off toward the high ground yelling, 'O'Neal! On me! O'Neal! Stay on me!'" "Wherever he went, I went,'' O'Neal said. Tillman reached the crest first with O'Neal and an Afghan militia fighter Krakauer identifies as Sayed Farhad. They scrambled a few feet down the lip of the canyon behind some boulders. But just then, two vehicles came speeding out of the canyon and stopped about 90 yards beneath the boulders. They looked up to see gunfire from across the ridge and then more coming from just above their position. The soldiers mistook Farhad, an Afghan with an AK47, for the Taliban and turned their guns on the small crop of boulders behind which Tillman and his fellow Rangers were wildly waving their arms. Farhad was gunned down. Pinned down by friendly fire behind thigh-high boulders, Tillman and O'Neal began to wave frantically, seemingly to no avail. O'Neal said he noticed that Tillman's voice suddenly took on a distinctly different tone -- Pat had a "cry in his call," is how O'Neal described it -- and O'Neal assumed Tillman had been hit, according to the book. Tillman, it turned out, had taken one or more shots to the chest plate of his body armor -- sharp blows that would have felt like a jackhammer hitting his sternum. Astounded that his fellow Rangers would act so recklessly, he began hollering at the top of his lungs, "What are you shooting at?! I'm Pat Tillman! I'm Pat (expletive) Tillman!" Moments later, Tillman's voice was silenced as several rounds hit him in the face, killing him instantly. None of the Rangers in the firefight that day conveyed the circumstances of Pat's death to his brother Kevin, though many, and eventually all of them, would learn what happened. Nor did any of the commanders on up the line to the Pentagon and the White House. Soon after his death, Tillman's Ranger superiors ordered that his clothes be burned, a clear violation of protocol, according to the book. It wasn't until days later, when Kevin Tillman, back in the U.S. for his brother's funeral, was on the verge of finding out the truth that White House and Pentagon officials finally relented and acknowledged the strong probability of a friendly fire death. News of their son's death hit Tillman's divorced parents hard, a relative, Alex Garwood, told Krakauer. "When Mr. Tillman walked in, he and [ex-wife] Dannie hugged across the table. He kind of pulled her across into a desperate embrace,'' Garwood said. "The [notifying] sergeant and I went outside to let them be alone. As we stood there, we could hear them wailing -- these primal kinds of screams." The death by friendly fire of the nation's most famous soldier came at a bad time for the White House and the Pentagon. In the weeks prior to Tillman's shooting, American civilian contractors were killed in Falujah, their bodies burned, dragged through the streets and hung from a bridge. An offensive into the city ended in stalemate with 27 Americans killed and 90 wounded.. The torture photos from the Abu Ghraib prison were circulating among official sources and about to burst into TV newscast and newspaper headllines. The 2004 presidential election was less than six months away. The result was a rapid deployment of the Pentagon's public relations machine. "The moment the White House learned of Tillman's death, the president's staff went into overdrive," Krakauer reports. "On April 23, the day after Tillman perished, approximately 200 e-mails discussing the situations were transmitted or received by White House officials, including staffers from Bush's re-election campaign, who suggested to the president that it would be advantageous for him to respond to Tillman's death as quickly as possible," he writes. "Jeanie Mamo -- Bush's director of media affairs -- sent an e-mail to Lawrence Di Rita, Rumsfeld's press secretary, asking for details about the tragedy so she could use them in a White House press release. "By 11:40 a.m, a statement about Tillman was drafted and forwarded to press secretary Scott McClellan and communications director Dan Bartlett, who immediately approved the statement on behalf of President Bush and then disseminated it to the public, even though doing so violated the 'Military Peace of Mind Act' -- a policy signed by the president just five months earlier which was intended to give families of war casualties twenty-four hours to grieve privately before any public announcement was made about the victim." Bartlett later said he violated the law to sate the "overwhelming" interest from the media. A Silver Star citation was initiated by the Second Ranger Battalion within hours of Tillman's death. The two witnesses were listed as O'Neal and Sgt. Mel Ward. O'Neal, Krakauer writes, later "testified that he was put in front of a computer and told to type up a statement, which he did, but after he wrote it, his words were embellished so egregiously that he never signed it." On April 29, a week after Tillman's death, the acting secretary of the Army signed the commendation. On April 30, a press release was issued, heralding Tillman for "his selfless actions after his Ranger element was ambushed by anti-coalition insurgents." "Where Men Win Glory" chronicles Tillman's remarkable rise through the NFL through the late 1990s, to perhaps the pinnacle -- when he was named to Sports Illustrated's All Pro Team in 2000. It also shows Tillman's sense of honor and loyalty. Krakauer recounts an amusing conversation between Tillman and his agent, Frank Bauer, about a lucrative offer from the St. Louis Rams that came in at the end of the 2000 season. "'Listen to me,'' Bauer said he told Tillman. "The Rams really want you and I don't see Arizona matching their offer. I'm going to fax the Rams' offer sheet to you. You have to sign it." But Tillman refused, calling back a couple days later to tell his agent, "Look, Frank, the Cardinals drafted me in the seventh round. They believed in me. I love the coaches here. I can't bring myself to take the offer from the Rams. ... I've made my decision. I'm going to stay with the Cardinals." "In twenty-seven years,'' Bauer says in the book, "I've never had a player turn down that big of a package in the National Football League. I've had players take twenty grand less per year to stay at clubs they really want to play for, but turning down nine-and-a-half million? That's unheard of. You just don't see loyalty like that in sports today." After 9/11, Tillman, whose family has a long history of military service, began soul-searching. "However, in the last few years, and especially after recent events, I'm no longer satisfied with the path I've been following -- it's no longer important." By the spring of 2002, he'd decided to join the Army with his brother Kevin. That sense of loyalty and commitment surfaced again in December 2003. After Tillman had served a tour in Iraq, the general manager of the Seattle Seahawks contacted Tillman's football agent and offered the young soldier another NFL contract. The Seahawks had done some research and determined that Tillman could be released from the remainder of his Army contract because he had served in a war zone. Tillman's sacrifice has been disheartening for many reasons, one of them militarily. Late last year, Krakauer concluded, "In April 2004, Pat Tillman was deployed to Afghanistan as part of a campaign to ... bring Khost Province under control of the elected government of President Hamid Karzai. Villagers throughout the area defiantly fly the white flag of the Taliban from their homes. Less than a mile from the eastern end of Tillman Pass (the name U.S. soldiers spontaneously bestowed upon the canyon where Pat was killed), a loudspeaker at a bustling madrassa blares anti-American messages into the surrounding community while young boys are instructed in the principles of jihad within the school's walls..."